To anyone who still believes females can’t rap, allow us to introduce you to rapper, drummer, singer and Inglewood native Tia P. She is not your average, “cookie-cutter girl.” Since age six, she has continued to make her point that girls can be “dope” rappers and song writers too. 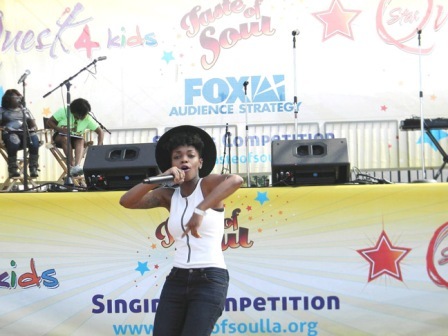 When the Sentinel last spoke with artist Tia P, she was getting ready to perform the song she wrote called, Mobbin’ & Wildin’ on the 94.7 the Wave stage at Taste of Soul 2015. After performing in front of thousands of people at L.A.’s largest street festival, doors have continued to open for her. She has gone on to secure a publishing deal with Riptide music, appeared in several commercial and print ads, and performed at sold out shows. In October, she was given the opportunity of a lifetime. When the opportunity presented itself to work alongside singer Tori Kelly, which allowed her to appear in her first national Pepsi commercial. “My pastor [at Faithful Central] always said be careful what you wish for, because when God starts opening doors, it will be fast, you won’t know where it came from, and that’s how it’s been since StarQuest,” said Tia P.
Her religion has played a major role in her willingness to remain humble and grateful for the doors God has opened for her. Before Tia P completely devoted her life to creating music for her fans, she attended Howard University, it was there that she graduated with a degree in Psychology with a music minor. When she isn’t writing music, playing music, in the studio, or on set of commercials, Team Tia P fans can find her enjoying life. “I like to go to the movies, watching Netflix, going for runs at 6 in the morning with my dog, spending time with my grandma, and just chilling,” said Tia P.
What’s next for the talented lyricist? “[My fans] can expect to see me on a TV show that involves Will.i.am, as well as the release of my new single, ‘Four Seats from Beyoncé’ which drops on the 16th and an EP shortly after that called ‘Peekabo Part 1’,” said Tia P.
To artist who are considering participating in the 2016 Taste of Soul StarQuest competition, Tia P has a few words of wisdom.